Good free-throw shooting down the stretch was key to the No. 4 ranked Southwest DeKalb Lady Panthers holding off a furious fourth quarter rally by the No. 10 ranked Arabia Mountain Lady Rams in a 63-58 Region 5-5A girls’ victory at Arabia Mountain on Monday. Southwest DeKalb (18-6, 11-0) led by as much as 22 points (49-27) with 30 seconds left in the third quarter on back-to-back baskets by Kennedy Morman when the Lady Rams started to swing the momentum. 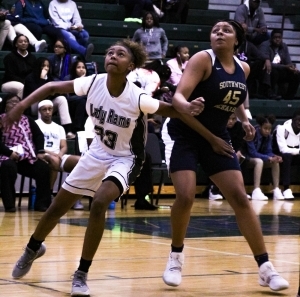 A three-pointer by Arabia Mountain’s Kennedy Binns with 14 seconds left in the third quarter started a 9-0 run by the Lady Rams (17-4, 10-2) that got them on track after a mistake filled first three quarters (24 turnovers). Three consecutive baskets off of Southwest DeKalb turnovers by Kennedi Manning, Jordyn Ward and Sydney Bunkley to open the third quarter cut the lead to 13 with 6:49 to play. Ke’Andrea Middlebrooks hit four consecutive free throws and Manning’s one of two from the line trimmed the lead to eight (55-47) with 2:46 to remaining in the game. Taylor Christmas made it a 10-point advantage for the Lady Panthers as she hit two free throws that would start a string of eight out of 10 for Southwest DeKalb in the final 2:17. Alina Shoemake had a pair of driving layups and the once insurmountable looking lead for Southwest DeKalb had shrunk to three (58-55) with 55 seconds to play. Kayla Kimbrough would hit three of four at the line and Raven Thurman added two more in the final 35 seconds as Southwest held on for the 63-58 victory despite a late three-point play by Middlebrooks. Southwest DeKalb was 10 of 12 from the line in the fourth quarter and 23 of 27 for the game taking advantage of the trips to the foul line. Hitting 13 of 15 from the line in the first half helped Southwest DeKalb build a 35-22 halftime lead. Raven Thurman led the way for the Lady Panthers with a 12-point, 11-rebound double-double and Taylor Christmas added 10-points, 6 rebounds and a pair of assists coming off the bench as 10 different players scored for Southwest DeKalb. Jordyn Ward led Arabia Mountain with 12 points while Kennedi Manning and Ke’Andrea Middlebrooks both chipped in 9 points and 8 rebounds in the game. The victory sealed the Region 5-5A No. 1 seed heading into the region tournament next Monday and an eighth consecutive trip to the state playoffs and 13th in 14 years for Coach Kathy Walton’s team as a first round bye in the region earns a spot in the Class 5A State Tournament. The No. 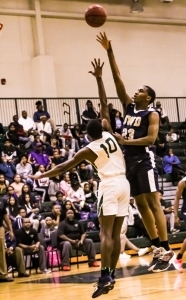 4 ranked Southwest DeKalb Panthers had 10 different players score on the way to an 82-46 Region 5-5A boys’ victory over the Arabia Mountain Rams at Arabia Mountain on Monday night. Arabia Mountain’s William Tayler hit a buzzer-beating three-pointer at the end of the third quarter to pull the Rams (6-18, 4-8) within 57-42 with a quarter to play. The Rams would then go the next 3:20 of the game without a point while Southwest DeKalb’s All-State guard KD Johnson hit five of six free throws to go with a basket by Rion White to push the lead out to 65-42. Arabia Mountain would get a free throw from Jaylen Outler and a three by Romero Head to break the Southwest run, but it would be the only points of the quarter for the Rams. White would get an old fashioned three-point play and a dunk in a 13-0 run that included back-to-back threes by Jordan Sanders and Casey Reeves as the lead ballooned to 32 points (78-46) with 1:49 to play. The game was 5-2 in favor of the Panthers (18-6, 10-1) with 3:40 to go in the first quarter when Chandler Sanders hit a pair of three-pointers on back-to-back trips up the floor to get the Southwest DeKalb offense rolling to a 21-8 lead. White struck for another three-point play to start the second quarter and then had an offensive rebound for the stick back for a 26-10 lead and the Rams would not get closer than 11 points the rest of the way. Johnson finished with 22 points and 6 rebounds to lead the Panthers to go with 13 points from James Glisson and 10 from Kusamae Draper. Romero Head led the Rams with 11 points on the night. The win moved the Panthers one win away from the Region 5-5A regular season title and a fourth consecutive state tournament berth.